Powers/Abilities: A normal human, Paul Haines had no paranormal physical abilities; he wore eye-glasses. An inventive genius, Paul built a "time-viewer" in an attempt to alter the past and acquire an ancestor's wealth. (Journey into Mystery I#33/2 (fb) - BTS) - Inventor Paul Haines' early life is largely unrevealed, but at some point he married Lenore. Paul never had any financial success, and he and his wife lived in poverty in his ancestral home. Although Paul's great-great-grandfather Cedric Haines had been wealthy, Cedric had been a spendthrift in the last year of his life and had squandered his entire fortune by his death in 1780, leaving nothing but his house for his descendents to inherit. 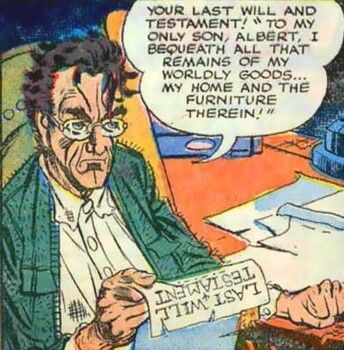 (Journey into Mystery I#33/2) - Paul sat in the study of his ramshackle home, reading his great-great-grandfather Cedric's last will and testament; Paul looked up at the portrait of his ancestor and angrily blamed Cedric for his own life's shortcomings--if Cedric hadn't been so selfish and wasted his money on frivolities, he would have had something to leave for future generations, and Paul figured that he himself would have been rich instead of a pauper! Paul went to the dining room, where Lenore served him the usual dinner--stew, again! 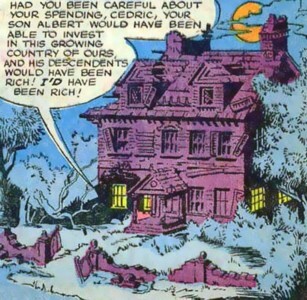 He told Lenore that he felt cheated by Cedric, and Lenore tried to comfort him, telling Paul he shouldn't waste so much time worrying about money that was spent in 1780; she encouraged him to concentrate on his inventions, then he might be successful. Suddenly, Paul was struck by an idea for a new invention which he could use to change the past. Paul took what little savings he had left to buy some equipment, then he spent nearly a month in his cellar workshop building his invention. 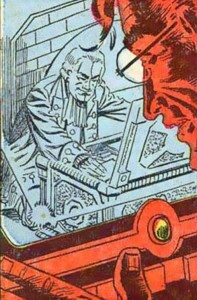 When he was finished, Paul showed Lenore his creation--a "time-viewer". 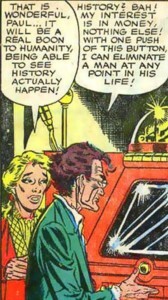 Paul explained to Lenore how he could use the device to "tune in" to the past and display the events on the machine's video screen--initially, Lenore was very pleased, because Paul's invention would be a boon to humanity and people could see history actually happen; but Paul told her that he would use the machine to get rich by "eliminating" Cedric (see comments) before he could spend all of his money, thus guaranteeing that his wealth would be passed down to Paul--Lenore was apprehensive about the whole idea, and she urged Paul not to trifle with the past. 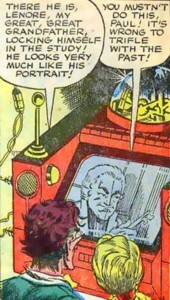 Regardless, Paul activated the device, and he and Lenore began to watch scenes from the past on the "time-viewer's" screen; they watched Cedric in the study checking a wooden chest filled with money, then they next saw Cedric making arrangements to spend his fortune on frivolous things. Despite Lenore's warning that no good could come of it, Paul pressed a button and "eliminated" his great-great-grandfather before Cedric could spend the money in the chest. Paul rushed upstairs to the study, where he found Cedric's money chest. Certain that he was now a millionaire, Paul broke the lock on the chest and found it loaded with cash...but the money was old Continental currency, completely worthless in modern-day America! 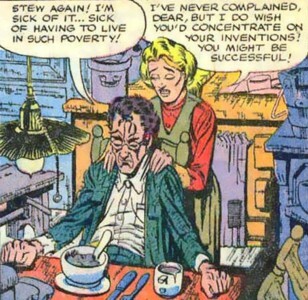 When the dejected Paul realized he was still poor, Lenore consoled him and pointed out that the money had become worthless soon after Cedric had died anyway, so he shouldn't feel cheated. With a new perspective, Paul told Lenore that he realized he'd wasted his life greedily longing for something that wasn't his, but from now on he'd make good on his own. Comments: Created by Carl Wessler (writer) and Steve Ditko (artist). This 4-page story -- There'll Be Some Changes Made -- is generally regarded to be Ditko's very first work for Marvel; it would be reprinted in Curse of the Weird#4 (March, 1994). 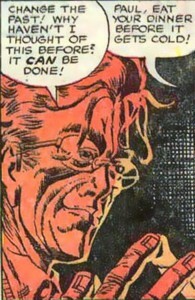 Paul Haines somewhat physically resembled the young Steve Ditko. Paul never mentioned any specific name for his invention, so I just called it a "time-viewer". 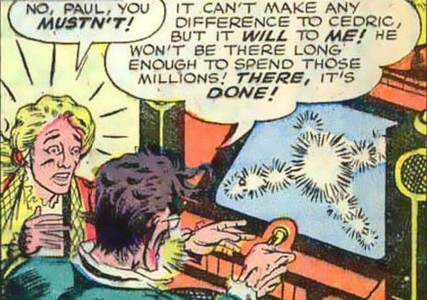 And Paul didn't explain exactly what the machine did to "eliminate" people (...and in regards to "eliminate": The Comics Code Authority had recently been enacted when this story originally appeared, so I guess many publishers were reluctant to use the word "kill" afterwards). Built by inventor Paul Haines in his cellar workshop, it somewhat resembled a large television set. The "time-viewer" could somehow "tune in" to past events and display the images on the video screen; additionally, it had audio amplifiers to provide sound for the images. Located below the screen at the center was a button; when pressed, it caused the person viewed on the screen to be "eliminated" (see comments) in some unspecified manner. The wife of Paul Haines, she stood by her husband despite his being impoverished. When Paul was depressed because his wealthy great-great-grandfather hadn't left any of his fortune for Paul to inherit, Lenore encouraged Paul to concentrate instead on his inventions. 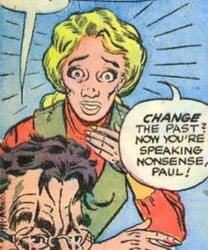 Lenore unsuccessfully pleaded with Paul not to use his "time-viewer" to alter the past in his attempt to prevent his ancestor from spending all his money, and she consoled Paul when his plan failed. Living in the 18th Century during the American Revolution, Cedric was Paul Haines' great-great-grandfather, and Albert was Cedric's son. Cedric was a wealthy man, and he kept all of his money (in the form of Continental currency) locked in a wooden chest in his study; by his death in 1780, Cedric had spent all his money, and in his will, all that he had left to pass on to Albert and the rest of his descendents was his New England house and all the furnishings within. In the last year of his life, Cedric became a spendthrift and began to waste his money on frivolities--he ordered a coach with the finest workmanship ("Spare no expense! "), to be drawn by the finest team of horses from England ("I've money to burn!"). He told Albert that he intended to go to Boston to have Paul Revere make some silver for their dining room--Albert begged his father to be cautious with his spending, but Cedric insisted there was no need to worry, for he had millions of dollars in the chest in his study. Unknown to Cedric, he was being watched from the future by his great-great-grandson Paul with a "time-viewer"; in a futile attempt to become wealthy, Paul used the device to "eliminate" Cedric (see comments) before Cedric could spend all his money, and the cash would be passed down to Paul. Located somewhere in New England, it was a mansion once owned by Cedric Haines in the 18th Century; it would be passed down to his family for centuries. It was eventually inherited by Cedric's great-great-grandson Paul Haines; by the time Paul lived in it, the old house had fallen into a severe state of disrepair.